Nestled along the Sheep River Valley in the heart of the Alberta Foothills, the Town of Okotoks is the largest town in the Canadian province of Alberta. Situated fifteen minutes outside Calgary city limits, Okotoks is currently home to 30,000 residents. Okotoks was the tenth fastest growing community in Canada from 2006-2011, with 42.9% population growth. Since 2011, the town saw 4% population growth from June 2011 to June 2012 and another 5% growth from June 2012 to June 2013. However, the town is undergoing an annexation process and is expecting population to grow over the next decades to approximately 80,000 residents. To manage the town’s operations, the IT and records management departments have used Laserfiche since 2004. However, the system was only used for records archival and storage, and the town knew its use of Laserfiche needed to expand to accommodate its expanding population. IT and records management (RM) were able to expand the use of Laserfiche throughout the city by governing its use, instead of dictating it. 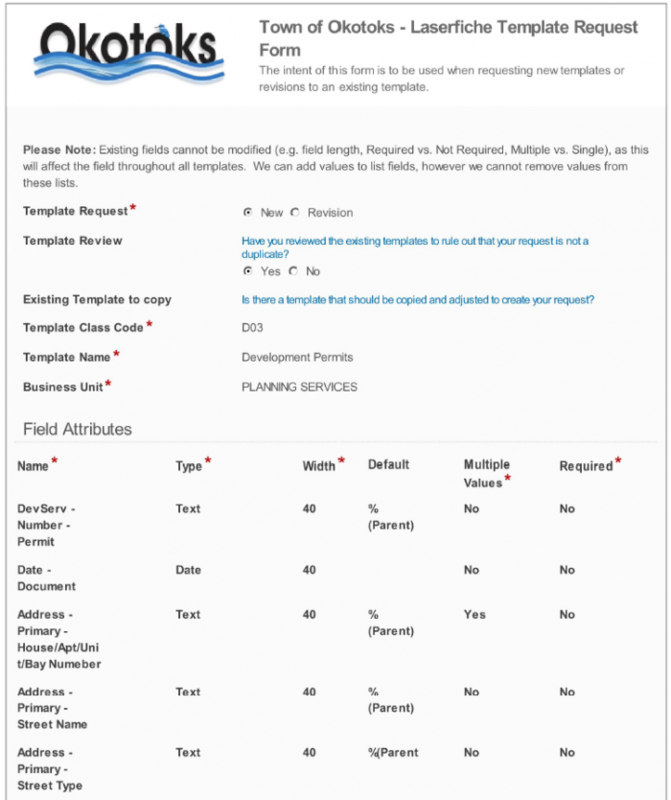 Previously, each document in Laserfiche had the same template with the same 10 fields appended to it. This structure did not lend itself to the types of documents that other business centres needed to work with on a daily basis. Business centres now use Laserfiche in a way that suits them, as long as it falls within the overall guidelines and standards. Business centres have a say in the metadata and access rights to records series, folders and documents related to their operations. Each unit controls the naming convention and develops the folder structure for everyone within the unit to use. 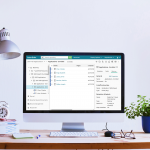 Laserfiche Forms is an essential tool in maintaining IT and RM governance while allowing individual business centres flexibility and customization. Here’s how the Town uses Forms to enable repository and records management. Once a form is submitted, Laserfiche Forms sends it to the appropriate manager for approval. After it is approved, the request is routed to the records management clerk who processes the request in a timely fashion. 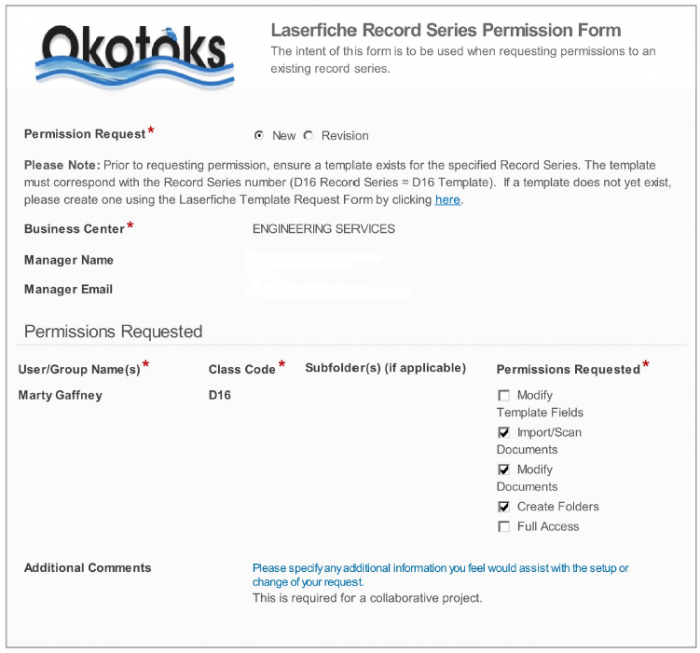 Okotoks’ IT team decided to teach as many people as possible to create Laserfiche Forms, leading to the rapid creation of a large number of forms. However, IT could not manage testing and publishing all the forms that were being created. 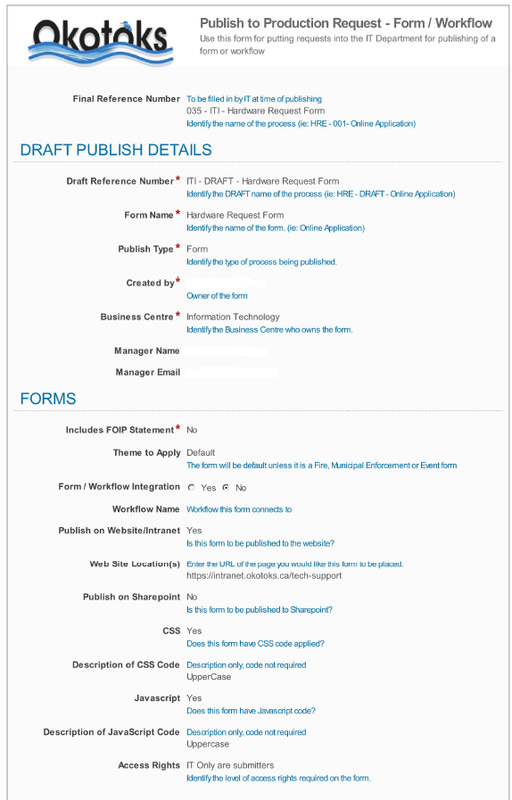 In order to give business centres flexibility to design their own forms but still maintain overall control, IT developed a form for users to fill out when then want to publish a form. This request covers many of the areas needed to publish a form. The initial form designer fills out a request to get the form published. Laserfiche Forms emails the manager who must review the form as well as the associated business process. This gives the manager an opportunity to understand each necessary step in the business process. If the requested form will be released to the general public, the initial form designer will have checked the “Includes Freedom of Information and Privacy (FOIP) Statement” box. If this is the case, after the form is reviewed, Laserfiche Forms sends an email to the FOIP coordinator who reviews the form to make sure that what is included meets the terms of the FOIP statement. Laserfiche Forms assigns the approved request to the quality assurance (QA) team who makes sure that the form meets the standards for all town forms and that it works as expected. If the form passes QA testing, it is assigned to the Laserfiche Administrator for publishing. The Laserfiche Administrator also sets up any associated fields, templates and folders in the repository that are necessary for the new Laserfiche Forms business process to run smoothly. The form is then saved to the repository so there is a record of the request and the date that the requested form was published. Laserfiche Forms notifies the form developer that the form is ready for user acceptance testing. Once the form passes user acceptance testing, the developer facilitates change management by letting his team know about the form and how it is going to impact existing processes. The developer confirms that change management practices have been put in place and Laserfiche Forms emails the front line staff and communication team in each town building with information on how to access the new form. This whole process is diagrammed in the Laserfiche Forms Process Modeler. Laserfiche Forms routes the request through various steps in the approval process before saving a copy of the form to Laserfiche. Requests are completed much faster than before implementing Laserfiche Forms, and the length of time it takes to complete each request is tracked, allowing for further improvements. Business centres were forced to look at forms that they had been using for the last 20 years and eliminate legacy information to present a form that is more fitting to their business today. Units also reviewed associated processes and significantly reduced the number of people required to process a particular form. Users are notified of denied requests by an automatically generated email with comments as to why their application was denied. This feedback helps the applicant understand what is necessary for a successful application and saves IT time by preventing them from having to write a separate email each time a request is denied. Get started with automating records management at your organization. Download a free copy of the Ultimate Guide to Electronic Records Management.